Writing a personal statement for residency is not a simple step. But this step plays a big role in your application process. Your personal statement should be written in a perfect manner in accordance with the prevailing guidelines and rules of the particular institute. Also, you need to keep in mind that particular programs have application requirements as well, so application papers for pediatric and radiology residency programs have some specification. Besides your statement should show your skills and discover your achievements. It has to be agreed that to write a really persuasive personal statement is a difficult task. Once you proceed to our order form, you will be asked to enter your personal information. In addition, there is an option to upload files that will aid one of our writers in analyzing your professional background. This includes previous resumes, essays, lists of accomplishments and or anything else which will help our writers understand how to best formulate your personal statement. This is a quick and simple step that should not take you more than ten or fifteen minutes. The payment form is the next step in the ordering process. Our main billing agent, Swreg.org, will process Paypal, credit cards, or any other type of payment. We offer a 100% money back guarantee! If you are not satisfied with the residency personal statement writing services, you can request a refund and we will happily return your money. Please remember that our personal statement writing services do not share your private information with anyone for any reason. At this point, we initialize the process of developing your residency personal statement. We will look over your information and assign a writer who is an expert in your field of study. The writer will analyze any provided supporting documents. If the writer needs any more information to begin writing your personal statement or admission essay they will email you with questions and arrange a phone call. Our writers are committed to excellence and they will create a document that represents you perfectly and accurately. Our writer will send you a rough draft of their work, over which you can look over and state any concerns, make comments or express your preferences. You are not obligated to accept the rough draft as is – simply tell our writer what you may want to be corrected, altered or added and they will gladly tailor it to your specifications. Our writer will keep you constantly updated on the status of the draft so that you are aware of what stage the personal statement is on and can make suggestions. Finally, we will send you the final copy of your residency personal statement. We will also send you a discount code for any future orders from our website and we truly hope you are satisfied with the end-product! Our qualified writers will help you to create winning application papers for a desired program and get you noticed by admission board! 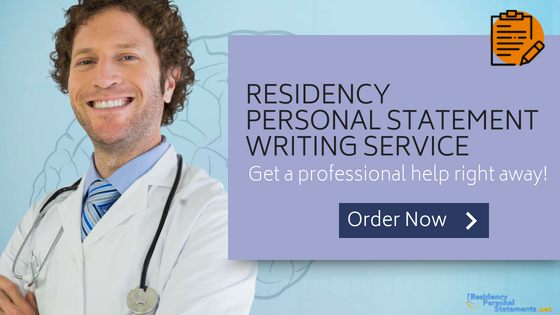 Writing a personal statement for residency with our help is a piece of cake, see it for yourself!